There's something interesting about watching The Good Wife back-to-back with Downton Abbey. Last week I talked about the various "Good Wives" on The Good Wife, and it would seem that is a good segue into talking about the good wives, bad wives and wives-in-waiting of Downton Abbey. For many of the female characters, the path to becoming a wife is all-consuming as well as challenging. But this marriage business might be put on hold for others as the War changes their lives. For simplification, seemingly the upstairs characters have more than love to consider: Mary must weigh class, financial security and the future of Downton Abbey itself in her consideration of becoming a wife. However, for all this logic, love weighs on her... and us! Don't we all just yell at the TV every time Mary and Matthew are on-screen together: "tell him!" and "why didn't you accept his proposal in the first place?" and "do it for love!" This is what gives Downton its drama: the struggle between what these characters should be doing to be happy and what they feel they must do to make others happy. Poor Daisy is also caught in this pickle with William. The downstairs crew have their own set of considerations, but (at least for Daisy and Anna), honesty and love are predominant factors that can trump anything. Sweet, naive William is off to war and wants to marry Daisy. Daisy, who does not love William (yet? 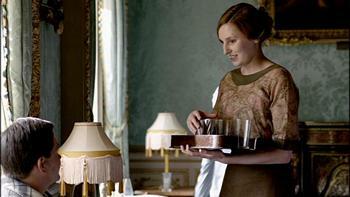 ), is stuck giving him a promise to wed after the war due to the encouragement of Mrs. Patmore. 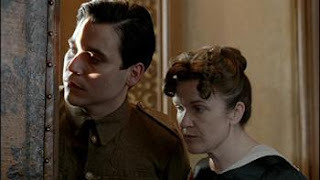 You feel for both William (who is off the the horrors of WWI and loves Daisy) and Daisy, who can barely hold in any lie for anyone (see: Mary's Turk, Mrs. Patmore's absent soup). 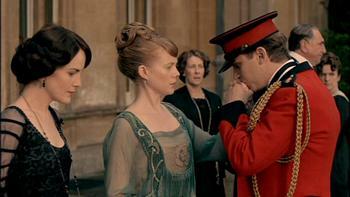 Daisy is doing the honorable thing, allowing William to go off to war with high hopes of marriage upon his return. 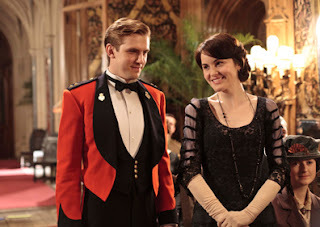 However, the end of Episode 2 sees William suggesting they marry before he goes. Drama Bomb! Other juxtapositions of this are alive and well in the house. Of course there's Anna, whose love for Bates is unwavering to the point of saying to Mary that she will live her whole life loving him. In probably the most telling scene to highlight this theme, Mary says basically that that's their lot in life now: to move on and marry someone who is okay knowing that it won't be true love. Anna says she won't ever do that. She will live her whole life loving Bates and will never move on. (Damn that horrible, evil, very BAD almost ex-wife of Bates'. Hopefully she goes away soon.) Episode 2 also gave light to some history of "that blonde piece" Lavinia as she discloses to Mary that she did give evidence to newspaperman Sir Richard in order to save her father from crippling debt. Here is another example of 1920's English Highborn Problems... and Mary sees herself in Lavinia's actions and decides not to use this delicious information against her and Matthew's engagement. And again I must scream at my TV: "Damn you, Mary's conscience!" While the roads to marriage are still prevalent, the world is changing and War makes for some interesting lifeplans. Sybil exemplifies this new world order in her rejection of Branson's declarations of love seemingly out of status concerns, but possibly because she is finding fulfillment in a career. And then there's Edith... where the heck does she fit in? She swings like a pendulum between cranky, spoiled brat ("my dress!" as poor Carson is having a heart attack), i.e. Old World and forward thinking bettering herself with life skills, i.e. New World. Last week we saw her using her new-found driving sKiLz by helping down on the farm. She was feeling good, feeling a part of something and that carried over into a smooch in the barn... possibly a roll in the hay?... with Mr. Farmer. Old World Edith would never, ever even BE on a farm, nevermind smooch a married farmer; New World Edith is devastated when Mrs. Farmer ends the deal. Is Edith crushed because she was in love? Doubtful. More likely it's because her raison d'etre has been taken away and she must float along again. But has the War literally invading Downton Abbey in the form of a convalescent center given her a puzzle for her puzzle piece? It must be so, since Edith has done the day to day caring of the soldiers so remarkably and quietly that everyone is stunned to hear that the soldiers give her all the credit for their comfort. Let's hope Edith has found her path and doesn't get sidetracked too quickly in this marriage business, as I am sure these convalescent officers will be propositioning her. 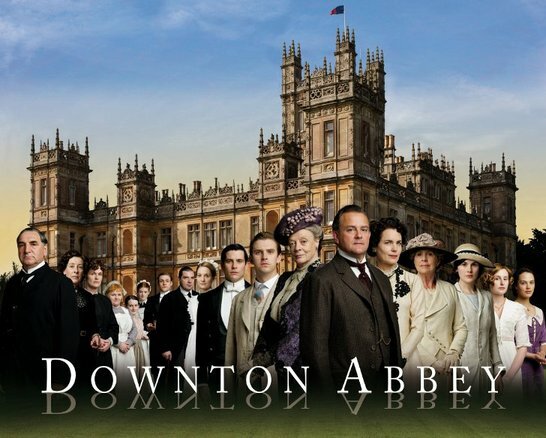 It is to Downton Abbey's credit that they pack so much intrigue, deep character development and plot movement into each and every episode. I think the key to the success of the show is that it is both detailed and fast-paced, and characters while being true to themselves, can evolve and adapt. I also thoroughly enjoy that while secrets are kept, just as many are shared among at least two or three characters. Lavinia's interlude with Sir Richard is quickly the topic of discussion and investigation between Dowager Countess Violet, Lady Rosamund and Mary. But as Dowager Countess Violet says, "I hate Greek drama. You know... when everything happens off-stage." - Thomas. Oh, Thomas. What is going on? Did everyone smile as I did when Thomas arrives and there is a shot of the doorbells and Upstairs is ringing! Brilliant shot, then punctuated with Carson looking at Thomas incredulously walking through the door. Aside: why does Mrs. Crawley hate Thomas so much? We all know he can be vile, but why does she look like she sucked a lemon every time he is mentioned? Is there history here that I am missing? - Poor Mr. Lang and his PTSD. In a strikingly subtle juxtaposition, it is clear there is no convalescent home for those who were damaged in the war, not physically but mentally. Where will he go now? He needs help and there's none to be had. Heartbreaking. - Branson! What the flip?! So are we to believe that Sybil's rejection is making him more aggressive in his conscientious objections to the war? He serves up a story about a cousin, but the timing seems off on that being his reason for becoming more vocal/active against the war, since it sounds like that happened over a year ago. And Sybil caused his heart murmur only last week (<--see what i did there?). I think his plot to dump nasty stuff on the General was as much about being outlandish for Sybil than any statement he was trying to make about the war. 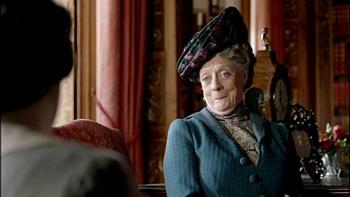 - Is there a better character on TV than Maggie Smith's Dowager Countess Violet? Just seeing her on-screen makes everything better. So hit the comment section with your answers to my questions: Why does O'Brien keep pushing for Thomas? Why does Mrs. Crawley hate him so? Should Daisy marry William? Will Anna and Bates find their happily ever after? Will Mary and Matthew? Or will I have to scream at my TV forever?